NEW YORK (CNNMoney.com) -- Dell has agreed to pay $100 million to settle fraud charges from the Securities and Exchange Commission, the SEC announced on Thursday, ending a five-year old case that has plagued the company and its chief executive, Michael Dell. The government regulator said Dell did not disclose to its investors "large exclusivity payments" that chipmaking giant Intel (INTC, Fortune 500) made to Dell in exchange for Dell's agreement not use chips made by rival chipmaker AMD (AMD, Fortune 500). The payments were so large that they made up 76% of Dell's operating income in the first quarter of 2007, and double-digit percentages of its earnings in several other quarters. The SEC charges against Dell extend to CEO Michael Dell. "It was these payments, rather than the company's management and operations, that allowed Dell to meet its earnings targets," the SEC said in a prepared statement. The SEC also found that founder Michael Dell, along with several other high-ranking company executives, were complicit in the disclosure violations. 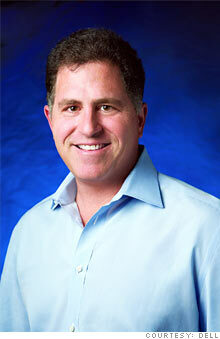 Mr. Dell agreed to pay a $4 million settlement out of his own personal funds. The company had acknowledged previously that Michael Dell was a target of the SEC's investigation, but the company's board said he would be allowed to continue as CEO and chairman of the board. The government first launched an investigation into the computer giant in August 2005, alleging violations of securities laws, including fraud related to Dell's financial reporting and to its disclosures about its financial dealings with chipmaker Intel. After an internal review that was completed in 2008, the company acknowledged accounting irregularities, and it adjusted its financial results from between 2003 and the first quarter of 2007. Shares of Dell (DELL, Fortune 500) were unchanged after hours after rising by more than 2% during normal trading hours Thursday.